The heavens opened as bands from throughout the country (and beyond!) began to muster in the various villages around Saddleworth Moor for this year’s contest. 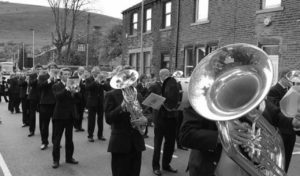 Wakefield Met Band braved the conditions to perform in four different villages and despite the inclement conditions came away with a first place win (2nd Section) in the final contest at Lydgate. The band’s musical performance was enhanced by the provision of carrot cake (baked by our multi-talented MD!) and pork pies (supplied by baritone-playing Chris!) as the coach travelled between villages!